A high performance silver bright and matte finish durable polyester label /seal that detects tampering with objects containing valuables, confidential information, or calibration equipment. The tamper indicating provide a "VOID" message in the surface when removal is attempted; you'll instantly know if someone peeled this security seal off. Tamper Void tamper evident security feature works immediately on most porous and non-porous surfaces after applied. This laboratory-engineered label can be applied on: Glass, Aluminum, Stainless Steel, powder coated metal, most plastics, paper, wood, printed circuits, etc... Popular applications include: computer cases, cell phones, file cabinets, aircraft hatches, entry doors, envelopes, cartons, electronic components and devices, hospital and laboratory equipment, etc. The adhesive residue left on the surface after tampering or removal of the label can be removed by rubbing with hand or by using our designed residue remover that will not destroy or damage any surface. 1000 Silver Bright TamperVoid Metallic Tamper Evident Security Labels Seal Sticker, Rectangle 1.5" x 0.6" (38mm x 15mm). Printed: Warranty Void if Label Removed. 500 Silver Bright TamperVoid Metallic Tamper Evident Security Labels Seal Sticker, Rectangle 1" x 0.375" (25mmx 9mm). Printed: Warranty Void if Removed. 10,000 Silver Bright TamperVoid Metallic Tamper Evident Security Labels Seal Sticker, Round/ Circle 0.625" diameter (16mm). 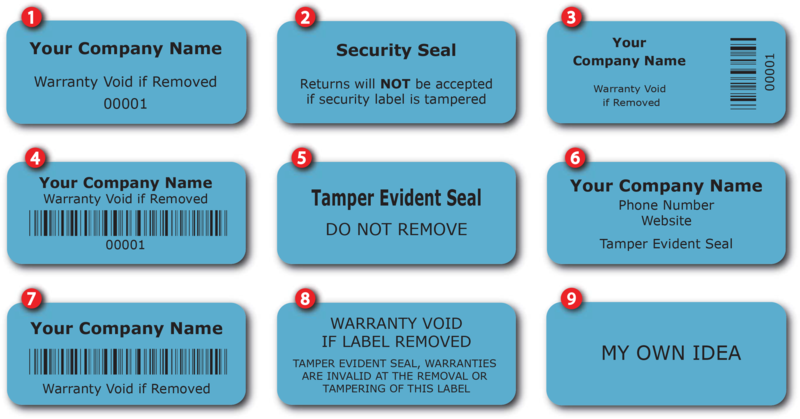 Printed: Warranty Void if Removed + Serial Number 5000 Silver Bright TamperVoid Metallic Tamper Evident Security Labels Seal Sticker, Round/ Circle 0.5" diameter (13mm). Custom Print. >Click on item details to customize it.